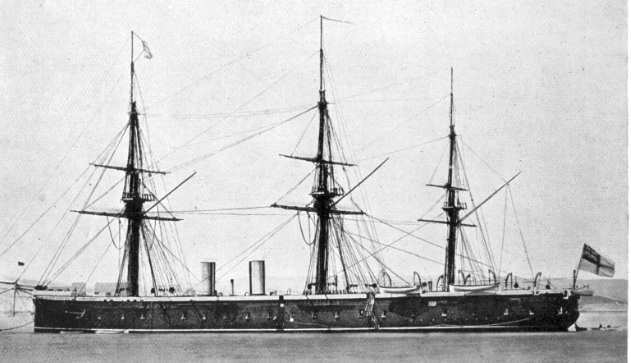 HMS Achilles, built 1861 as an armoured frigate, renamed Egmont in 1904 and employed as a depot ship at Chatham Dockyard. 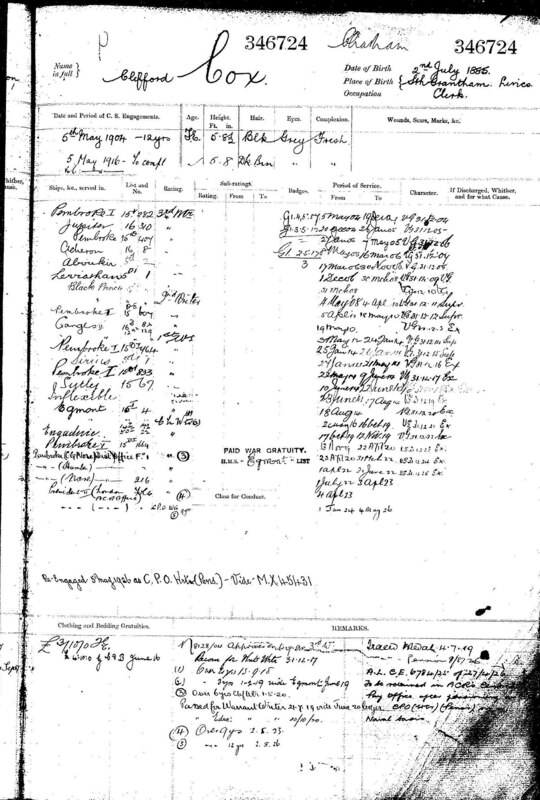 The single page of Clifford Cox's navy service record that was located online. Clifford Cox was born on 2 July 1885 in Bottesford, son of Henry and Mary Ann Cox. Henry Cox was born in 1858, in Hitchin, Hertfordshire. Mary Ann Cox was born in 1857, in Nottingham. There were six sons and one daughter in the Cox family: Harry (born 1881, died 1894), Sidney (born 1883), Clifford (born 1885), Leonard (born 1889, died 1890), Walter (born 1892), Albert (born 1898) and Lilian (born 1894). In 1891, the Cox family lived in the New Railway cottages, by the railway bridge on Nottingham Road. Henry Cox was a railway signalman born in 1858 at Hitchin, Hertfordshire, and his wife Mary Ann was born in 1857 at Nottingham. With them were three sons, Harry (b.1881), Sidney (b.1883) and Clifford (b.1885). In 1901, the family lived on the High Street, Bottesford. The house was located on the northern side of High Street, at its western end, set back from the main road, on the corner of High Street and The Nook (Pinfold Lane). The children were Sidney (working as a commercial clerk), Clifford (also a clerk), Walter (b.1892), Lillian (b.1894) and Albert (b.1898). Clifford left home in 1904 to join the Royal Navy. His younger brothers Walter and Albert also served in the First World War. Walter joined the infantry and fought in France. Albert however followed Clifford by joining the Royal Navy as a clerical officer, a Writer. Clifford Cox’s service with the Royal Navy commenced on the 5th May, 1904. He served as a Writer on a number of shore establishments and ships through his long career from 1904 until 1926, and probably for some significant time after that. This was an important clerical role, administering to personnel, logistical and planning requirements. He worked in a large range of ships and shore bases, though it is unclear what exactly his duties were, except when he became involved with the pensions administration late in his career. In the Census of 1911, he was recorded as a Second Writer, Accountant Branch, living at Ganges II, Harwich, Essex. 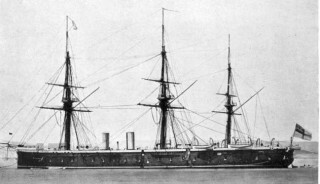 This confirms that he was in the Royal Navy, at this time living at the Shore Establishment known as Ganges II at Harwich, with rank of Second Writer, in the Accountancy branch of the navy. His one-page service record that is available online gives the following complex series of postings. It appears that during the First World War itself he was located at the shore establishment at Chatham Dockyard. Inflexible, from 23/6/1914, an Invincible-class battle cruiser – Clifford Cox was on board this vessel on August 4th, the day the United Kingdom entered the war. Engadine, from 17/10/1919, a Sea-plane tender – Clifford Cox was on board this vessel on November 11th , the day the Armistice was agreed. Clifford Cox was awarded the 1914-15 Star, the British War Medal and the Victory Medal. He was re-engaged on 5/5/1926 with the rank of CPO Writer, and was a Chief Writer at “HMC Gd, Harwich”, at the time he received these awards. It is rather unclear what vessel or depot this refers to, but his post was probably in connection with the Royal Naval Dockyard at Harwich, which was an important base in both the First and Second World Wars. The record states that he was paid a War Gratuity, but gives no details. Clifford Cox’s naval career continued for several years after the end of the war, but at present we do not know when he finally left the navy. 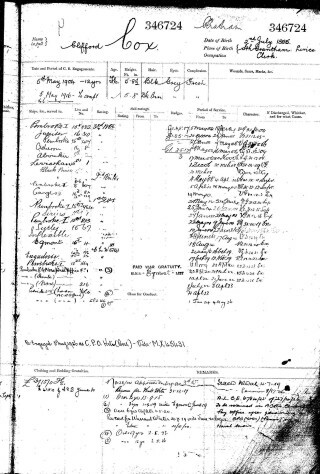 The General Register of Births, Marriages and Deaths (BMD) records that he died at Chatham in June 1958. It seems unlikely that he returned to Bottesford, but no further details of his life after leaving the navy have been located.